We came to Transnational Literate Lives in Digital Times (TLL), Patrick W. Berry, Gail E. Hawisher, and Cynthia L. Selfe’s 2012 book-length collection of digital literacy narratives, from three different vantage points: as doctoral students in a writing research methods seminar, an undergraduate student enrolled in a composition pedagogy class, and, finally, as the professor of record for both classes. Each of us read TLL to learn more about individual histories with technology and also about the collaborative methods for locating, gathering, and presenting the digital narrative content of TLL. TLL did not disappoint: Berry, Hawisher, and Selfe provide a dynamic and purposefully multi-vocal discussion of digital literacy practices as told by a collection of inter- and transnational undergraduate and graduate students to “suggest different and increasingly accurate ways of understanding the life histories and digital literacies of those with transnational connections, attempting to take into account local perspectives and the complex processes of globalization” (“About” para. 1). Berry, Hawisher, and Selfe deploy a collaborative, multimodal approach to storytelling to highlight affordances digital media bring to research as a way of presenting a more comprehensive account of participant experience than exclusively alphabetic text allows. Embedded video clips allow readers to see and hear Mirza Nurkic describe his family’s 1988 move from the former Yugoslavia to Australia (Chapt. 2). Readers watch the video Ismael Gonzalez’s narrative “Writing: Pain or joy,” (Chapt. 4), and so on. Those who have been traditionally considered to be “research participants” function as coauthors, as fellow storytellers in TLL. An additional break from tradition, Berry, Hawisher, and Selfe also provide direct and reflexive attention to methods and methodology, making the text a must-read not only for new(er) digital literacy researchers, but for any researcher looking to develop expertise in reading and conducting person-based, digital, feminist, and/or collaborative writing research. In American higher education, writing instruction has been historically localized in English departments. This legacy has presented barriers for advocates of WAC and WID, who have pushed to develop programs that distribute writing instruction across the curriculum. If that legacy has created problems for the teaching of writing, though, it’s also created problems for writing research. The kinds of empirical research questions WPAs might need to address in their home institutions don’t always square with the textual and historical methods often taught in English departments, where many of those rhetoric and writing PhDs have trained. That’s the writing studies methods conundrum, although programs certainly have developed localized responses to this issue. Some PhD programs have split from English departments into stand alone departments, a move that might provide more robust opportunities for diverse methods training. Other programs, like the program I graduated from at UW-Madison, provide composition-specific methods courses, and then encourage students to bolster their methods by taking courses in other departments, like education. Held for the first time last August at Dartmouth’s Institute for Writing and Rhetoric, the Dartmouth Seminar on Composition Research was designed to help sharpen the methods of composition researchers, with some participants in attendance because they have experienced manifestations of the methods conundrum in their own scholarly lives. The tacit assumption that seemed to float through the seminar was that writing studies needs to sharpen its methods (to be fair, writing studies is not the only relatively young discipline where I’ve heard complaints about methods; I’ve heard similar complaints at internet studies conferences). As Charles Bazerman pointed out in the seminar introduction, we need more carefully articulated methods for the sake of local administration projects, national intervention (where statistics is the coin of the realm), and interdisciplinary collaboration. This is especially important in international contexts, as European writing research comes from applied linguistics, and interdisciplinary collaboration requires carefully articulated methods. The seminar consisted of an intense two weeks of group classes and individual meetings with workshop facilitators. Workshops offered perspectives on both qualitative and quantitative methods. Twenty-six people attended, some of whom were faculty and some of whom were graduate students. Christiane Donahue, the workshop organizer, coordinated an immaculate and extremely rigorous seminar. She collected information about our projects months in advance to create relevant programming and generate reading lists. She kept a loaded program on track, and she scheduled some of the major writing studies methods gurus as facilitators. We began with some virtual sessions months in advance of the seminar. On site, Charles Bazerman began the seminar talking about general approaches to methods and methods as a series of principled choices made in situ. Cheryl Geisler then spent three days teaching a tightly focused discourse analytic method of qualitative coding, which included individual consultations with Geisler almost every day to talk progress. Geisler’s approach made me think hard about segmenting qualitative data for analysis, especially because the grounded approach I use has far less to say about how such data should segmented. Even though I am developing a coding scheme via grounded theory for my own research, Geisler’s system will surely be useful in the future, and it made me reexamine all of the assumptions I have made about the schema I currently use. Drawing a crowd early on a Saturday morning, Chris Anson and Les Perelman gave an excellent seminar on writing program assessment, and Perelman gave a separate but equally fascinating seminar on the shaky use of statistics that the College Board uses to argue for the validity of the writing portion of the SAT. Christiane Donahue ran a discussion on writing and knowledge transfer. Christina Haas gave two sessions, one about nonparametric statistics, and one about research ethics. Finally, Donahue tapped into Dartmouth resources and drew on faculty and staff members to run sessions on statistics, data visualization, and working with review boards and institutional research offices. I tended to pay close attention to my methods in graduate school, and I received good training from my own program in the English department and from the education department. I attended the Dartmouth seminar because in the past year I collected a large new qualitative data set that generated some specific issues I needed to address before I began analysis. The centerpiece for me was thus opportunities for individual consultations with the facilitators. I came looking for help sorting out analytic procedures for the seventy-some interviews I have now completed with three vastly disparate groups of writers. I had opportunities to meet with the faculty and have extensive conversations about the data set. In addition I met with facilitators about undergraduate research and an article in process. These consultations aligned with the general philosophy Christiane Donahue had for the seminar: each participant should use the seminar to do what was best for his/her project. From what I understood, there are plans for the seminar to be an annual event. I assume it’s most appropriate for advanced graduate students, junior faculty members, and faculty looking to retool. I suspect it will be most helpful if you have advanced far enough on a project to know what kind of methodological problems you are having. Again the structure of the seminar and Christiane Donahue’s work to tailor the seminar will make it profitable for a wide range of participants. I feel like I received good methods training in graduate school and I still learned something every day. I’m hoping this year will be just the first in a long string of methods seminars, and if you can secure funding from your institution, it’s well worth the time and effort for those looking to shape a large project. My greatest regret will be having missed the scene from the first seminar that may become the subject of lore: Charles Bazerman belting out tunes in tenor accompanied by two seminar participants. “What is it that you do?” asked the gentleman sitting across the large round table in the cafe area during lunch at Google I/O, the annual software developer’s conference held in San Francisco. “I’m a professor at Ball State University,” I said. “Oh? What department?” he replied, no doubt wondering if I worked in HCI, computer science, or informatics. “I’m actually in a department of English,” I said, noting the raised eyebrows and grins from the three others sitting at the table. “I study and help develop applications for distributed work, especially to facilitate networked writing collaboration,” I explained. “Man, you must be the only English Professor here!” he said. He’s probably right. 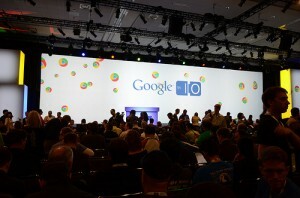 I was likely the only English Professor at Google I/O, both this year and last, when I traveled to the conference with my research partner, Paul Gestwicki, a computer scientist at Ball State. But that probably shouldn’t be the case. Those of us in the computers and writing community should probably be spending more time hanging out with developers at developers’ conferences (e.g., OSCON, PyCon, Defrag, etc). And software developers should probably be spending more time with hanging out with computers and writing researchers. At the 2010 version of this conference, attending breakout sessions was much as you might expect; you peruse the agenda, select a session based on subject matter, presenters, or (ideally) both, and amble casually into the room a couple minutes before the start. That’s what I’d planned to do about 10 minutes before the Social Skills for Geeks session, and that’s when I noticed the line of people waiting to get in, stretching down the hall for about 150 feet, and out into the Developer’s Sandbox venue, where start-ups displayed their wares. The session itself, led by Brian Fitzpatrick and Ben Collins-Sussman, was fascinating, as were many of the follow-up questions from attendees during Q&A. There were no open seats that I could see (and I was sitting in the back row), in a room that probably held 400–500 people. The session started with a simple statement: “we’re here to talk about working with human beings.” Early in the session, Fitzpatrick suggested that “the social stuff is really hard. It’s more squishy. It’s a lot less deterministic.” Collins-Sussman added that, essentially, if you want to be a sucessful software engineer, you need to focus on the social aspects of developing and shipping your applications. One of the recurring themes from this session was the importance of writing work in supporting the everyday collaboration practices of developers. “You need to document it [your work],” one of the presenters argued. “If it’s not written down anywhere, you will still see people coming in and arguing with you. Keep a trail of documentation so people know where you’ve been and where you’re going.” Fitzpatrick and Collins-Sussman were likewise focused on organizational culture, and, not surprisingly, writing’s role in shaping and mediating that culture (even though they didn’t describe it in those terms). For example, during the Q&A period following the presentation, a 23 year-old developer asked a question about disruptions caused by a new team member who is in his 40s, and who isn’t respecting the norms of the collaborative. Fitzpatrick and Collins-Sussman suggest that this is a case of “cultural invasion.” “Are there specific development practices that you all adhere to?” they asked. More importantly, “is it [the culture] documented?” they added. Their answer to the young developer focused on cultural norms, the documentation of those norms, and the role of the developers themselves—not the management team—in helping to enculturate new team members. “What are the tools you use on a regular basis to define your culture?” they asked, more generally, adding that in their own practice there’s a strong focus on the social and interactive aspects of group work—things like beers on Friday, nerf guns in the workspace, and eating lunch together (while not necessarily talking about work). Social media is important too, as interstitial writing work that helps mediate collaboration and enculturation. Fitzpatrick and Collins-Sussman argued something very similar. Perhaps by spending more time with software developers, researchers in computers and writing can better effect the robust interdisciplinarity that we’ve been seeking, in a way that can truly enrich both disciplines. Many educators have asked students to work collaboratively on wikis. Take for example this list of school and university projects using Wikipedia. And the increasing adoption of wikis for teaching was the focus of Sonia Kolesnikov-Jessop’s recent New York Times article, “For More Students, Working on Wikis Is Part of Making the Grade,” in which she describes how students at several Singapore universities are being required to collaboratively write articles—in one example, on digital media in India (it’s unclear from the article whether these students are writing for Wikipedia). The professor involved in this project explains how his students learning has improved through a writing-to-learn approach. Rather than memorization of information for exams, students had to engage more profoundly with the material in order to write about it. Moreover, he’s using the assignment to put students in a public writing situation and help students gain a broader and deeper notion of audience, one in which they not only edit each other’s work but also receive feedback from readers beyond the classroom. I could go one regarding the benefits this professor describes, but instead, I want to focus on a topic that fundamentally speaks to teaching about writing and teaching with Wikipedia or wikis in general. I’ve been interested in the often-at-odds mindsets that come with conceptions of individual and collaborative authorship as well as how these mindsets manifest in school and voluntary sites of writing such as Wikipedia. In my teaching, the aim has been to help students recognize these mindsets and learn about the “conflict and tension between the values, beliefs, attitudes, interactional styles, uses of language, and ways of being in the world which two or more Discourses represent” (Gee, 1989, p.7). Based on my research on the World of Warcraft Wiki (WoWWiki), I’ve found it’s necessary for contributors to have the ability to shift mindsets when writing in a particular context. That is, from what I’ve seen on the wiki’s talk pages, those contributors who are less skilled in collaborative authorship stand out, for example, in the way they will use “I” and “my” to talk about their contributions, while more experienced contributors tend to use “we.” I see something similar in my writing courses. For instance, I’ve had students who started new articles on Wikipedia and come back later to find it marked for deletion. The initial response is panic: “Will I still pass the assignment if my article gets deleted?” Or students want to know how I will separate their edits from those of others. Of course, I expect these reactions. That they worry about the grade is natural in the context of school. What students come to see is that the text they have contributed to Wikipedia is no longer theirs alone. It can be revised by others: deleted, moved around, expanded. They have to learn how to work with others, and separating out who did what loses importance, hopefully. It makes for a productive conversation, and I often find myself going back to Candace Spigelman’s (2000; 2004) work on writing groups. She found that more experienced writers “shared common ‘insider’ knowledge about writing theory, processes, and strategies …” (2000, p. 119) and that less experienced writers had difficulty in their peer review groups because did not share these beliefs, values, attitudes, and practices regarding writing. She suggested that novice writers needed to learn how to be more like the experienced writers before they could fully benefit from writing groups. Both my research and Spigelman’s point to the importance of uncovering the ways of being a particular kind of writer in a particular situation. Having them write on Wikipedia is one way to accomplish this goal. It’s less about what they’re writing or how well and more about helping them develop a meta-awareness about how that writing is organized by circumstance—in this case, what it means to write somewhere other than in school and as an individual. In contrast to my assignment, Cummings broaches discussions about Wikipedia’s culture before asking students to contribute to Wikipedia rather than after. But the activity we’re both asking of students is to go beyond writing for Wikipedia and consider what it means to participate in a discourse community. In addition to Wikipedia policy and guideline articles that explain how to participate on Wikipedia, part of learning to work on Wikipedia, I would argue, includes asking students to examine what happens between writers on article talk pages and why talk pages serve an important function in the collaborative writing process. Schneider, Passant, and Breslin (2010) report that recent studies of Wikipedia have found that “Talk pages have been added more quickly than articles, growing at a rate of 11x, compared to 9x for articles. Over a 2.5 year period, edits to Wikipedia Talk pages nearly doubled from 11% to 19% of all page edits, while article edits nearly halved from 53% to 28% of all page edits” (p. 2-3). They add that Viegas (2007) found articles with talk pages had been edited more and have more editors. I think it’s fair to say that more revision will result in better writing. And while I haven’t studied whether more talk results in more revision that results in better writing on WoWWiki, my experience tells me that “featured articles” have many—sometimes dozens of—contributors to talk pages and are generally much longer than talk pages of non-featured articles. More importantly, talk pages are one of the main sites of enculturating newcomers. At the end of the day, I want students to be able to recognize the characteristics and norms of the writing culture they find themselves within. To ask and answer certain questions when entering a new writing situation, such as What kinds of knowledge count? What methods of knowledge construction (e.g., collaborative) are valued and effective? Study of and participation on a site of writing like Wikipedia can give students powerful knowledge that helps them to navigate through future writing situations.